The coolant heat storage tank systemstores hot coolant and feeds it via theelectric water pump automatically to warmthe engine as required. This system helpsgenerate clean emissions. 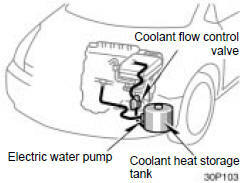 To confirm thecoolant heat storage system check, thepump may operate automatically with thevehicle stopped (in the “OFF” mode). Although the pump may operate andcause noise while the vehicle is stopped,this does not indicate a malfunction. The coolant in this tank is hot evenif the engine and radiator are cold. For replacement of the coolant,contact your Toyota dealer. Do not touch bolts (9 pieces)painted in yellow. In case the bolts are loosened,there is a risk of hot coolant comingout from inside the tank. When this has any malfunction, thesurface of this tank gets hot. Toprevent burning yourself, do nottouch the tank. In such cases as the time of enginestarting and a short trip after theengine is stopped, the electric waterpump will work for a moment, butthis is no problem. This is for the preparation for goodemission.